The tachometer is not a new invention, but being able to build a digital tachometer in less than an hour by yourself shows you how far technology has come. 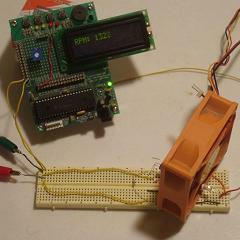 This tutorial guides you through the process of building your own PIC based rpm counter! Hi dear I want the tachometer to switch ON a relay at a certain speed limits. example: 17,000-17,500 RPM and OFF the relay upon reaching 17,500.